PERFECT 3CH ECG(Std.) WILL MAKE YOU ECG ANALYSIS SPECIALIST. 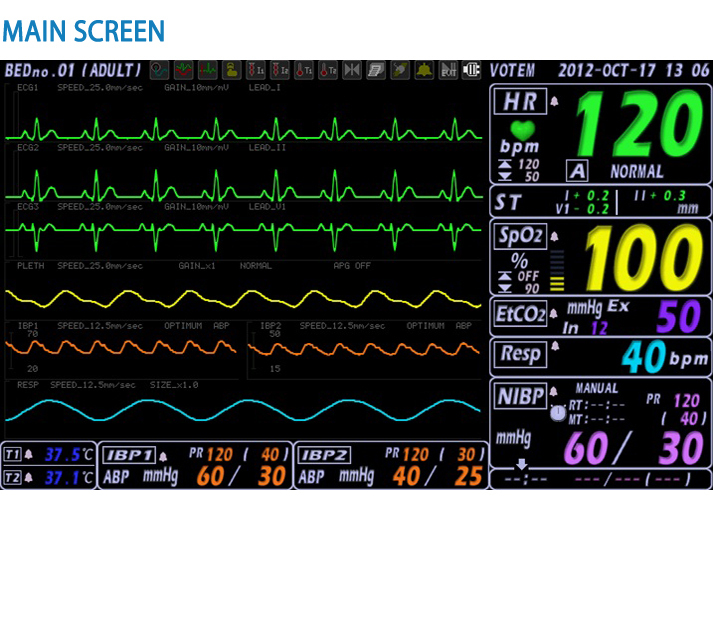 Selectable color configuration of waveform and numeral for all parameters up to 18 colors. NIBP can be measured from 5 to 15 minutes automatically. Stores patient’s admission date, ID, name, gender, date of birth, weight, and height. Manages individual EVENT data up to 20 cases in case of Arrhythmia. 21st Century CO2 Technology for side stream CO2 monitoring in both intubated and nonintubated patients. 21st Century CO2 Technology for main stream CO2 monitoring in critically ill, intubated patients.